Need Help Installing Your Landscape Design Features? Desert Environments Makes it Easy. In this part of the country, being outside is a possibility almost year round. But not without the right amenities. Deck overhangs, misters, fans, and shaded seating allow homeowners to relax or entertain comfortably outdoors. 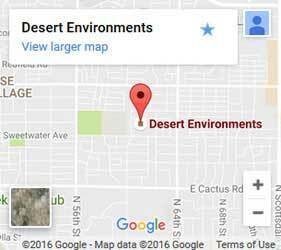 At Desert Environments, our landscapers make your vision of a cozy private paradise possible. Desert Environments takes your design and makes it a reality by installing rocks, gravel, pathways, seating areas, patios, outdoor kitchens, and entertainment features. Our crew works with you or your designer to ensure that every element is precisely placed and built to last. Our team has over 25 years of experience. And that means we're prepared for any of your landscaping questions. 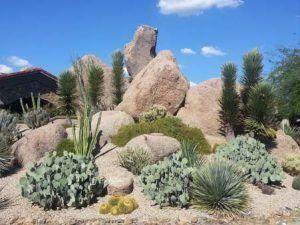 Desert Environments knows the key to successful desert landscaping. With the right combination of shade and sunlight, your outdoor area can be vibrant and lush with plant life. And by building practical, comfortable living spaces such as outdoor patios, pools, and kitchens, you can enjoy the exterior of your home without having to worry about temperature or privacy issues. Our team is skilled at building spaces that minimize heat and sun exposure so you can stay comfortable outdoors. Talk to us about furniture and hardscaping materials that don't absorb heat, how to structure outdoor kitchens to maximize efficiency, and how permeable pavers can help retain water for grass and plants. We can also install lighting systems that rely on solar energy to illuminate your favorite areas at night. The options are endless. Just let us know what you'd like your front or backyard space to look like, and we'll find smart solutions that will serve you well into the future. Whether you're starting from scratch or improving an existing landscape, you're adding value to your home. And Paradise Valley properties are highly coveted, so there is little risk in investing in your outdoor space. No matter what you're looking to do, we work with an extensive network of local suppliers and can find materials at the right price for any budget. It doesn't have to be extravagant, either. Many of our clients simply want to take their barren backyard and make it useable. We work with you to find the right balance. And if you'd like to install additional features later on, we'll be around in the future to pick up where we left off. 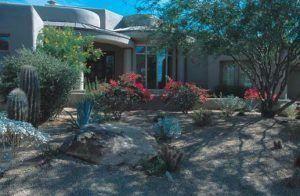 Call Desert Environments in Paradise Valley for landscape design brought to life the right way. © 2019 Desert Environments. All Rights Reserved.